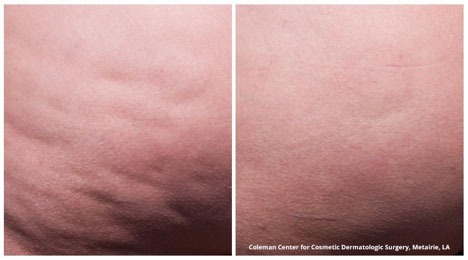 Pacific Dermatology & Cosmetic Center is thrilled to be one of the few practices in the Northwest to provide this innovative cellulite treatment. No more creams, massages, rollers, and heat-based treatments with lackluster, short-term results. In just one treatment, Cellfina™ can significantly improve the appearance of cellulite on the buttocks and thighs. Improving the appearance of cellulite, Cellfina will be giving women the confidence to wear the hemlines and bathing suits they’ve avoided for years. Dr. Reichel has been searching for a reliable, effective treatment for cellulite reduction. Finally, with Cellfina, we can achieve results with long term satisfaction. Cellulite is caused by factors such as hormones, genetics, and lifestyle choices. Often, no amount of diet and exercise can diminish the dimpled appearance of skin. And, although liposuction can help to decrease unwanted fatty tissue, it is not designed to improve cellulite. The Cellfina™ System is the only FDA-cleared minimally invasive procedure clinically proven to improve the appearance of cellulite for at least three years—the longest FDA-cleared duration for a cellulite treatment. If cellulite is still reduced at three years, we at PDCC feel that it will likely be a rather permanent treatment. For some patients, we may combine cellulite treatment with skin and tissue tightening from a procedure such as Ultherapy, or Skin Tyte by Sciton. Performed in our Medicare and AAAHC accredited ambulatory surgery center, Cellfina™ is safe, effective, and delivers long-term results. With 94 percent patient satisfaction three-years after the procedure, Cellfina™ is becoming the new standard for cellulite treatment. Patients in the clinical study showed significant improvement within three days after the treatment. Three years after treatment, 100 percent of Cellfina™ Patients had noticeable improvement (based on the Global Aesthetic Improvement Scale (GAIS)). Cellfina™ Patients report high rates of satisfaction with their treatment results. At three months, 85 percent of patients were satisfied, at one year 94 percent were satisfied, after two years, 96 percent of patients were satisfied and after 3 years, 93 percent of patients were satisfied. Cellulite occurs because of a problem with the layer of connective tissue beneath it. Vertical tethers (fibrous septae) go through the fat and insert into the undersurface of the skin. The tight bands pull down the skin, creating the puckering you see on the surface of the skin. Cellfina™ System is unique in that it treats the primary structural cause of cellulite—these connective tethers woven throughout the fat in the thighs and buttocks. Similar to a rubber band under tension, once released, the treated skin bounces back to smooth itself out. The Cellfina™ System relies on a minimally invasive, small needle-sized device to treat the cellulite-causing bands just beneath the surface of the skin. Having years of experience with liposuction procedures, Dr. Reichel feels very comfortable using the Cellfina system to treat patient’s cellulite. WHAT CAN I EXPECT from Cellfina? Cellfina™ is a straight-forward procedure performed in our ambulatory surgery center – using the highest degree of safety for patients. Before treatment, the dimpled areas of thighs and buttocks are marked. Then the Cellfina™ platform is applied to the skin. It has a suction device that brings the skin into the Cellfina™ System, and it makes it taut for us to treat easily. A local anesthesia is used to numb the skin. Once the skin is numb, the Cellfina™ platform is reapplied, the suction is engaged, and a tiny blade is inserted to free the fibrous bands pulling down the skin and creating dimples. This process is called “subcision.” With Cellfina, the subcision is very precise. Once the bands have frayed, the dimples are released, leaving smoothed skin. Patients truly experience very little pain during the treatment. There is limited downtime associated with Cellfina™. Some patients experience initial soreness and tenderness. Expect this to last for at least a few days. At Pacific Dermatology & Cosmetic Center, we ask our patients to rest for 24 hours after treatment. They can then begin resuming normal activity. Results are visible in as little as three days, but it may take a few months for the final results. Swelling and bruising are common after Cellfina. The best thing, results are still evident three years after treatment. Cellfina™ has minimal side effects, including soreness and sometimes bruising. More than 90 percent of patients had no bruising at the four-week mark. WHO IS a candidate for Cellfina? Unlike men, women’s connective tissue is vertical in nature and more susceptible to the formation of cellulite. In fact, it is reported that as many as 80 percent of women regardless of size have cellulite. If you are like most women, you may have cellulite and are an excellent candidate for treatment. We recommend you visit us for a consultation to determine if Cellfina is right for you. Please call 206-859-5777 or contact us to schedule an appointment.